This photo was taken on February 14th, bottling day – yes I know I am a hopeless romantic! I did sample the brew….. I had to pull a sample to check the specific gravity and I hate to throw anything away….. a lot like my Dad. Well, it was tasty but too, too sweet. I let it sit and sampled again in mid March. Not mature enough…. a lot like the Cheezit commercial checking on the maturity of the cheese used.Remember this was brewed on December 20th, 2010! My Imperial Stout was not quite ready so back into the dark it went. I had to brew a replacement Wheat beer for my little brewing buddy – Lindsay Waterman – because the “Waterman Wheat Ale” picked up an infection…… soured the beer – I can’t wait to have a cat free brewing zone!!!!!! 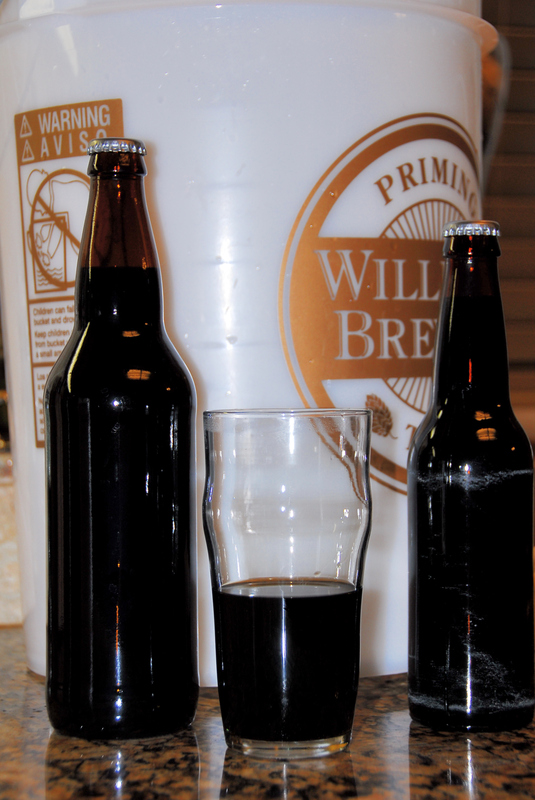 Back to the stout – I put a bottle in the fridge the day before and sampled it on Monday the 18th of April, Ahhhhh! It is definitely maturing nicely. I gave my son, Ben and daughter Ashleigh a taste of the second bottle last night and even though they are not stout fans they gave it good marks. I loved the smooth feel in the mouth and the flavor has really mellowed – not too sweet and much less bitter than the Irish Stouts like Guinness. I think I will give it some more time and as it is about 10%-11% alcohol. It is a special occasion beer/stout and the 2 cases should last many months. Let’s also hope that I am successful at getting the new “Waterman’s Wheat Ale” into the bottle without an infection this month! Damn cats! An Update – Summer 2012 – lone remaing, surviving 22 oz bottle of this incredible beer was consumed. It only improved with age…kinda like me! No, more like my wife. I must make a plan to do this one again!